Breeding for 18 years, we raise our kittens as part of our family. They’re not caged, but instead sleep in our arms and beds. Hairless cats attract attention by their unique look, but it’s their amazing personality that wins your heart. HCM scans are done on our parents every year, with breedings kept to a max of four years. Parents not only possess the healthiest, hardiest lines, but also those that have the loving personality that Sphynx are famous for. We’ve found through years of purebred breeding that through outcrossing lines, creating Sphynx Special Traits, we ended up with healthier offspring. This reduces, if not removes, health issues that can follow purebred, in-line breeding. Outcrosses have no known reports of HCM. 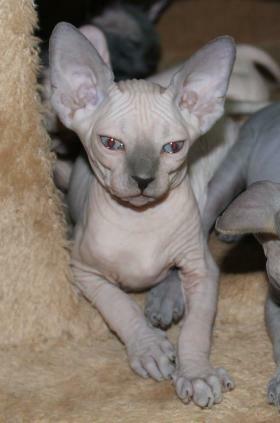 Platinum Sphynx – Bambino /Sphynx Kittens.